You absolutely CAN beast your way to next-level productivity by yourself. The power isn’t hidden outside of you. It’s lying dormant inside of you. All you have to do is tap into it, and you’ll have a wealth of unshakable focus at your fingertips. But uh, as you might have come to realize, it’s pretty freaking hard to overhaul the roadblocks that are standing tall in your way. What we are discussing is cutting the cord between you and the most common online sidetracking bogies. Don’t keep Twinkies in your house. It’s the same concept, and it’s overwhelmingly effective. So here are some time-saving, distraction-stiff-arming tools that will undoubtedly help you be more productive. 1) Momentum: Encouraging motivation every time you crack open a new tab on your browser. Right now, whenever you create a new tab, regardless of your intentions, you are bombarded by daunting, seductive traps that beg your immediate attention. Google Chrome presents you with your most frequently visited sites right off the bat, which is basically like dangling carrots in front of a horse. This might look like Chrome is being sweet and trying to make your day easier, but whether it’s on purpose or not, it is fatefully tempting you to veer off course. This tool persistently reminds you that a) you have a boatload of ish to do today and b) you can absolutely, positively handle all of it because you are superman, all the while eliminating the romantic allure of the Facebook tab staring you down with googly eyes. 2) News Feed Eradicator: Going straight scorched earth on the useless drivel that your loose acquaintances shove down your throat. You don’t care about Jamie’s stamp collection, so why are you thumbing through all 115 photos? Likely because you don’t want to get to work. Now, we’re not pointing the finger. It could be a conscious stab at procrastination, but the odds are that you’re not even aware of how much time you’re wasting because the powerful magnetism of social media has you gasping for air in its vice grip. The problem here is that as soon as you open Facebook, you are confronted by your timeline. A quite literally endless stream of things that do not even remotely pertain to your interests is calling your name. Keep in mind that we are not trying to trash talk Facebook at all. It is an incredible asset when used correctly, so dropping the outlet altogether might come back to bite you. This, along with #3 and #4, will help level the playing field and keep your head in the game. Instead of jumping ship, use News Feed Eradicator. The typical garbage that fills up your screen when you log in will now be replaced by an inspirational quote. Perfect! Finding time to be productive can become elusive so Entrepreneur Amber Kelsey gave us some killer tips on How to find more time in your day. 3) Facebook Messenger: Because communicating with your customers is more important than creeping through their profiles and liking Christmas photos from 2011. Are you logging onto Facebook to respond to a consumer query or hit that investor back? First of all, have you ever heard of email? Either way, using the Messenger app grants you access to all of your conversations without teasing you with the downright evil option to sniff through your newsfeed and troll your day away. 4) Facebook Pages: View insights and make posts without being reminded that your brother is drinking out of coconuts in Jamaica while you’re stuck in the office. In a perfect world, you can handle all of your business matters through your company’s page, keeping your personal affairs on your personal account. Using the Pages app means that, when you log in to handle business stuff, you will only have access to business stuff. Nothing personal will be readily available. 5) Hootsuite: Owls aren’t just for delivering parcels to Hogwarts anymore. Yes, this neck-swiveling night bird can plan your social media strategy in advance. Like we’ve discussed, social media has become an inarguably necessary evil. Going against the grain and attempting to make it “off the grid” could mean the implosion of your business. In the modern era, it’s a matter of making it work for you. Making original content posts or sharing things on your page’s timeline is a great way to engage consumers and other businesses. Having an active feed helps maintain your brand’s active image. However, how much time do you actually devote to staring at your screen, racking your brain for interesting things to post? Every day, and for some people, multiple times per day, you remove yourself from your current task to dip your toe back into the social media pool. You know this by now, but we’ll remind you: Removing yourself = productivity loss. Oh wait, there is. And it’s called Hootsuite. You can even go full-on left-brain and schedule all of your posts months ahead of time. This way, you won’t have to open up the social apps during your workday in the first place and risk being whisked away by some Buzzfeed article about expensive pizza. Spending 20 minutes a day on social media can really add up. From opening the tab, resisting mindless clicking and scrolling, crafting the perfect post, and posting it, the whole endeavor can really devour precious clock time. With Hootsuite, you can knock a bunch of it out in one sitting, concentrating fully in social media mode. Making something your primary priority and staying focused on that one effort for a period of time drastically streamlines the quality of your posts. 6) Slack: The grown-up version of AOL Instant Messenger. It is a little different, though. When running a team, instant communication is absolutely essential. Try to block out the temptation of simply using Facebook or Skype for chatting purposes, because other people signing on might steal your attention away. The Slackbot keeps it real AF, too. It don’t play no games. It’s more of a business-centric instant chat program, where you can send lightning-fast messages to coworkers. This is another classic example of keeping your business with your business and your play with play. While incredibly useful, if you’re not careful, it can devolve into AIM 2.0. Don’t fall into the GIF trap! Admittedly, it is fun to shoot goofy jokes back and forth, and it definitely can help ease your mind during a busy day, but don’t let it become a habit. 7) LastPass: For when you are fed up with getting locked out of your accounts because you can’t remember your FREAKING passwords. “It was bahamamama12, right? Or was the B capital? Wait, is this one of those sites that requires a special character like an exclamation mark or an underscore? Oldest trick in the book. 60% of the time, it works every time. Let’s not spend this whole section talking about how annoying and taxing it can be to keep track of your plethora of slightly different passwords for online accounts – although we totally could. This tool streamlines sign-ons, while only requiring one single password in total. The pressure is off, and that goldfish memory of yours can finally come to terms with its inadequacy while leaning on a computer program to do the heavy lifting for it. The buck doesn’t stop there, though. You can share accounts and passwords with people on your team, which means that you won’t have to buy multiple accounts for each member. This saves you time, money, and hassle. What more could you ask for? You shouldn’t be, because you can create folders within your account that only certain users can access. You have free reign over who can look at what, adding and removing people as you please. Got beef with LastPass for some strange reason? No worries, there are other options. Try 1Password or KeePass. 8) RescueTime: Watching your every online move like some NSA big brother, but for good reason & with your permission. At first glance, this sounds a little skin-crawly and violating, but give it a chance. Yes, it meticulously records all of your activity down to the minute. Yes, the idea of having to come to terms with how you spend your time online sounds mortifying. But it will be so, so good for you. We promise. It shines a light on your deepest, darkest, most insidious habits (like browsing Amazon for phone cases) and presents you with an opportunity to kick them. This Chrome extension tells you the ugly truth: You spent an hour and 18 minutes watching Vine compilations yesterday. Come on man, you’re at work. Get it together. RescueTime isn’t just a finger-pointer, you wounded soldier. It’s time management software, designed to highlight your online behavior and hopefully inspire change, if necessary. Reviewing the statistics will also grant you the ability to see through the illusion of sites that masquerade as productive and useful, but are actually giant time-gobbling beasts. Being aware of how you spend your time is the first step in the journey of making the necessary amendments to boost your productivity. Conveniently, this tool doesn’t ask you to log everything yourself – and let’s be real, you would definitely fudge the numbers anyway. The quantification of something like this can have a tremendous impact on your daily habits. Of course you will feel convicted, but sometimes that’s what it takes to kick nasty habits. Consider it an AI intervention. We certainly get that, but don’t let yourself grow too proud to accept help. Many of these tools are widely used, and only wish to help you establish yourself in a brand new foundation of healthy habits. It’s not like taking steroids or anything. More like a vitamin. Or just buying veggies at the grocery store. You likely won’t need to use these forever, either. Initially, they are here to ease you into the new, doubly productive chapter of your life that is right around the corner. Soon, you’ll be an absolute beast when it comes to dodging distractions and staying focused for hours and even days at a time. For the moment, though, don’t be afraid to reach out and grab one of these helping hands. Who knows? Maybe the simple free download of one of these programs could save you from some of your most devious pitfalls. These tiny tweaks to your procedure are only going to gift you with more hours on the clock each day – hours you can spend churning out top-quality productivity. Speaking of improving your productivity we’ve created an e-book with the entire 5 part series. If you are serious about making a change – make sure to add it to your e-reader and get started! 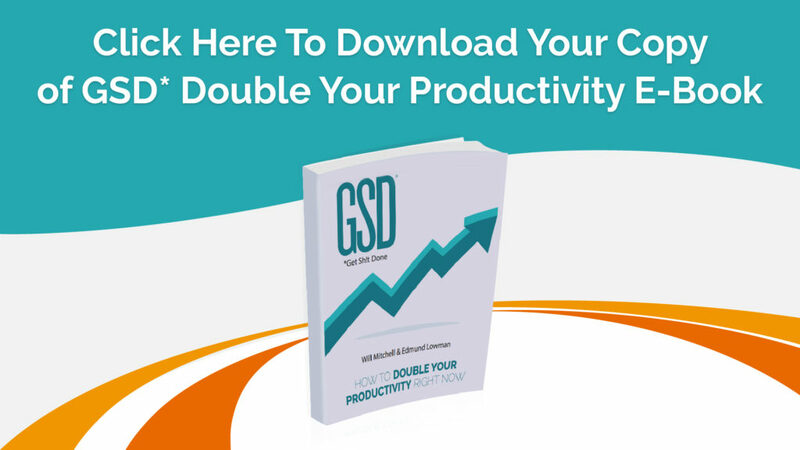 Get The Entire Double Your Productivity – Get Sh*t E-Book NOW! Hootsuite, Slack, and Rescue Time are always my favorite. Makes you more organized, chat functionality with team in slack and Notification reminder of Rescue Time. This makes you more productive . Slack was the biggest game changer for us. We do everything on Slack it’s almost like our beating heart! Buffer and Asana could also be honorable mentions. I think we’re going to do a follow up post about the ones we didn’t mention!